MICHEÁL MARTIN HAS told Enda Kenny that Fianna Fáil is not prepared to go into a partnership government with Fine Gael and independents. The two party leaders met for the second time in 24 hours this afternoon, but the meeting was short-lived, lasting between 10 and 15 minutes before the talks broke-up. 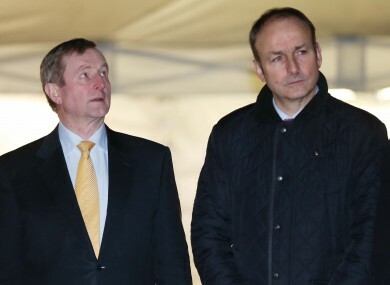 Martin rejected Kenny’s proposal for a full partnership government, involving the two parties and independent TDs. Kenny had made the offer during last night’s meeting between the pair in Leinster House. Fine Gael said the offer remains on the table, but there are no further talks between the two parties planned ahead of next Thursday when the Dáil will, for the third time, try to elect a Taoiseach. Fianna Fáil said it had rejected the offer in the national interest, as the country would not be best served by a coalition of the two parties. Fine Gael said the national interest was not served by Fianna Fáil’s rejection of the offer. The two parties will now continue their respective efforts to form minority governments, but the breakdown of talks would appear to increase the likelihood of a second election. Martin questioned the integrity of Fine Gael’s offer saying his relationship with the Fine Gael leader left “a lot to be desired”. Kenny said that Fianna Fáil’s rejection of his proposal is “driven by narrow party interests”. The remarks indicate worsening relations between the two leaders. FG source: Taoiseach has told Micheál Martin that his rejection is based on narrow party political grounds and not in national interest. Martin told the media a short time ago that Fianna Fáil is “prepared to facilitate the formation of a minority government” and said his party ”believe in the concept of minority government”. Fianna Fáil will continue its own efforts to form a minority government, he added. I am prepared to lead a minority government myself if the Taoiseach doesn’t want to lead a minority government and I put that to the Taoiseach earlier. The Fianna Fáil leader said that his party is open to further talks with Kenny, but said it will not go into government with Fine Gael, having made that commitment during the general election. We made this promise consistently in advance of the election. We made it clear to the Irish people, and to those who were voting for us, that we would not go into government with Fine Gael and we’re remaining consistent and true to that commitment we made. Martin said governments with large majorities are “not good for democracy”, citing the record of the outgoing Fine Gael/Labour coalition. Asked about his relationship with Kenny, Martin said that the events of the last 24 hours had left “a lot to be desired” and questioned the “integrity of the entire process”. Martin claimed that Kenny told him yesterday evening that minority government was being “taken off the table”. He questioned this given Fine Gael had engaged in talks with independents for the last three weeks. There was an element of choreography about it, but that’s par of the course in terms of how the Taoiseach does his business. A spokesperson for the Taoiseach said Fianna Fáil’s rejection of the partnership government proposal with “serious haste” is “extremely disappointing, very unfortunate, and a mistake”. We in Fine Gael think that the decision by Fianna Fáil today has been a historic missed opportunity. He said that “a very generous and very real offer” had been tabled by the Taoiseach, saying it would have changed Irish politics and responded to the “very complex political landscape” and help address the needs of the Irish people. The Agriculture Minister said that Fianna Fáil’s rejection of the offer is not in the national interest, but it “remains on the table”. He said it was disappointing that Fianna Fáil hadn’t even considered the offer for a day. Fine Gael also rejected Martin’s claims that minority government had been taken off the table, with the ministers insisting that the party is looking for a stable government. This evening, bookmaker Paddy Power has slashed the odds on a second general election taking place this year from 4/1 to 6/4. Email “Over before it even started: Enda and Micheál's brief meeting ends with no plans for government”. Feedback on “Over before it even started: Enda and Micheál's brief meeting ends with no plans for government”.